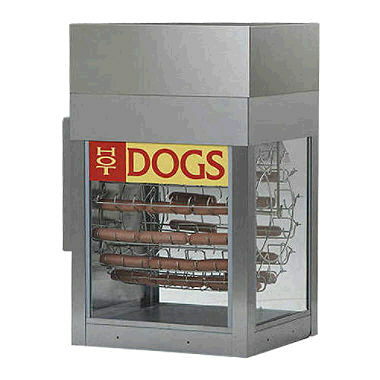 Dogeroo Hot Dog Rotisserie needs 120 volt, 12 amp electric outlet. Size 21" W x 15" D x 21" H with bun warmer tray. Weight 52 lbs. Capacity 36-48 hot dogs. Large hot dogs from refrigerator will be ready to eat in 20 to 30 minutes. Rental includes hot dog tongs for serving. * Please call us for any questions on our hot dog rotisserie holds 36 48 rentals in Ft. Wayne IN, Warsaw, Syracuse, Auburn, South Bend, Indianapolis IN.